Gage Repeatability and Reproducibility allow assessing a measurement process. 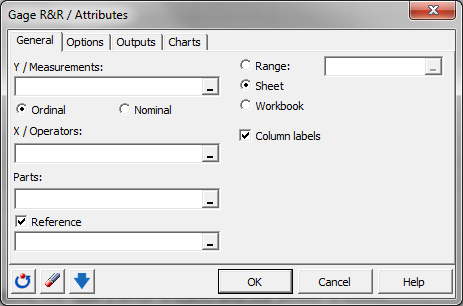 Gage R&R for qualitative variables available in Excel with the XLSTAT software. Measurement System Analysis (MSA) or Gage R & R (Gage Repeatability and Reproducibility) is a method to control and judge a measurement process. It is useful to determine which sources are responsible for the variation of the measurement data. Variability can be caused by the measurement system, the operator or the parts. The word gage (or gauge) refers to the fact that the methodology is aimed at validating instruments or measurement methods. In contrast to the Gage R & R for quantitative measurements, the analysis based on attributes gives information on the agreement and on the correctness. The concepts of variance, repeatability and reproducibility are not relevant in this case. A high agreement of the measures taken by a given operator for the same object (product, unit, part, or sample, depending of the field of application) repeatedly, shows that the operator is consistent. If the agreement of a measurement system is low, one should question the quality of the measurement system or protocol, or train the operators that do not obtain a high agreement, if the measurement system does not appear to be responsible for the lack of agreement. A high correctness of the measures taken by an operator for the same object (product, unit, part, or sample, depending of the field of application) in comparison to the given reference or standard value shows that the operator comes to correct results. If the correctness of a measurement system is low, one should train the operators so that their results are more correct. Correctness can be computed using the Kappa or the Kendall statistics. Kappa coefficients can be used in the case of qualitative and ordinal quantitative measurements. Kendall coefficients can be used in the case of ordinal measurements with at least 3 categories. The two concepts agreement and correctness can be computed for a given operator, for a given operator compared to the standard, between two operators and for all operators compared to the standard. The goal of a Gage R & R analysis for attributes is to identify the sources of low agreement and low correctness, and to take the necessary actions if necessary. The XLSTAT Gage R & R for Attributes tool is used to control and validate your measurement method and measurement systems, in the case where you have several qualitative measures taken by one or more operators on several parts. It is possible to calculate these statistics in all of the sections. In the intra rater section, XLSTAT computes for each operator the number of cases where he agrees with himself for a given part across repetitions. Additionally the ratio of the number of cases and the total number of inspections of the operator is computed. 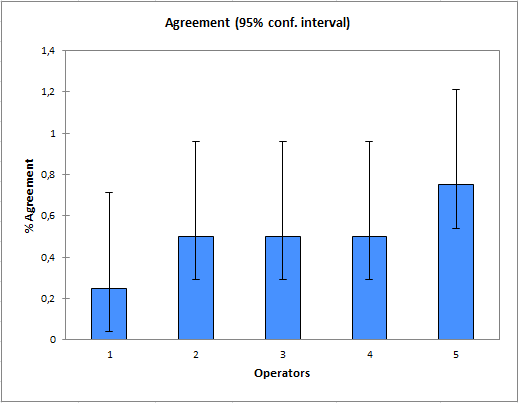 In the Operator vs. standard section, XLSTAT gives the number of cases where an operator agrees with the standard across repetitions. Additionally the ratio of the number of cases and the total number of inspections of the operator is computed. In the inter rater section, XLSTAT computes the number of cases where all operators agree for a given part and across repetitions. Additionally the ratio of the number of cases and the total number of inspections of all the operators is computed. 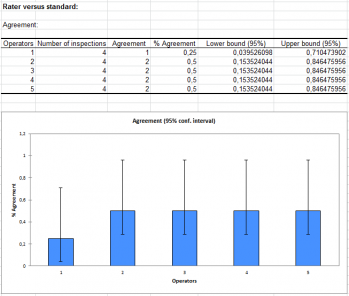 In the all operators vs. standard section, XLSTAT computes the number of cases where all operators agree with the standard, across all repetitions. Additionally the ratio of the number of cases and the total number of inspections of all the operators is computed. In addition, confidence intervals are calculated. For proportions, XLSTAT allows you to use the simple (Wald, 1939) or adjusted (Agresti and Coull, 1998) Wald intervals, a calculation based on the Wilson score (Wilson, 1927), possibly with a correction of continuity, or the Clopper-Pearson (1934) intervals. Agresti and Caffo recommend using the adjusted Wald interval or the Wilson score intervals. False Negatives: This statistic counts the number of cases where a given operator systematically evaluates a part as category 0 while the standard evaluates it as category 1. Additionally the proportion of false negatives across all parts of category 0 is displayed. False Positives: This statistic counts the number of cases where a give operator systematically evaluates a part as category 1 while the standard evaluates it as category 0. Additionally the proportion of false positive across all parts of category 1 is displayed. Mixed: This statistic counts the number of cases where an operator will be inconsistent in the rating of a given part across repetitions. The proportion of such cases computed as the ratio between Mixed and the total number of parts is displayed. 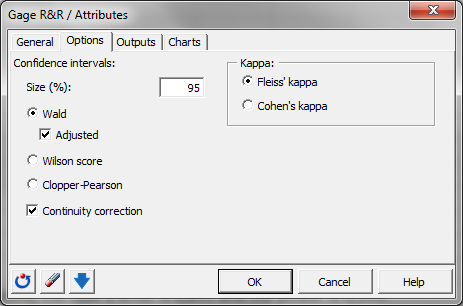 Cohen’s and Fleiss Kappa are well suited for qualitative variables. These coefficients are calculated on contingency tables obtained from paired samples. The Fleiss’ kappa is a generalization of the Cohen’s kappa. The kappa coefficient varies between -1 and 1. The closer the kappa is to 1, the higher the association. In the case of an intra rater analysis, it is necessary that 2 or more measures have been taken by an operator for a given part. In the case of operator vs. standard, the number of the measures for each operator must be the same as the number of measures for the standard. In the case of inter rater, the number of the investigations for the two operators being compared must be the same. 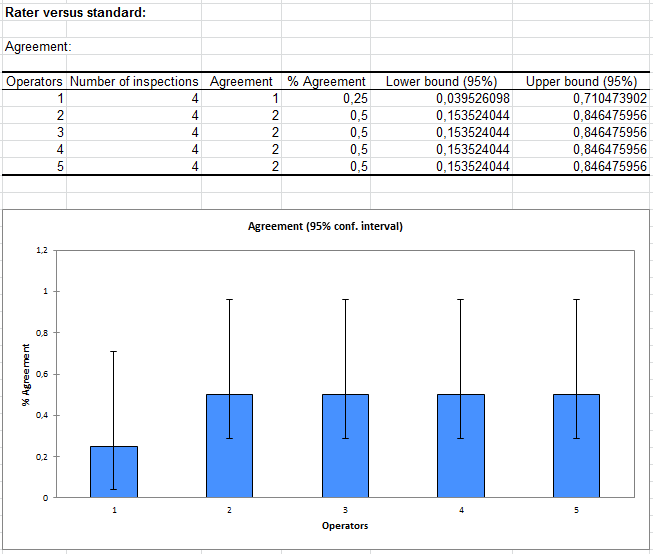 In the case of all operators vs. standard the number of investigations for each operator for a given part has to be the same. 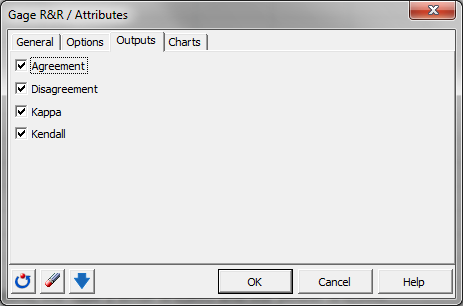 These indicators are available for ordinal quantitative variables with at least 3 categories. Kendall’s tau: This coefficient, also referred to as tau-b, allows to measure on a -1 to 1 scale the degree of concordance between two ordinal variables. The Kendall’s coefficient of concordance: This coefficient measures on a 0 (no agreement) to 1 (perfect agreement) scale the degree of concordance between two ordinal variables.